It shouldn�t be any surprise that this sequel, released nearly one year to the day after its predecessor, doesn�t break new ground, nor does it harbor any such aspirations. The formula was such a winner the first time around - hacking its way to a $40 million gross (in 1980 dollars) on a mere $700,000 budget - that the filmmakers opted for a similar approach with part 2. We have the prologue, a catalyst for the events to follow, a cast of fun-loving counselors in training and, last but not least, a knife-wielding maniac just waiting to kill them off one-by-one. 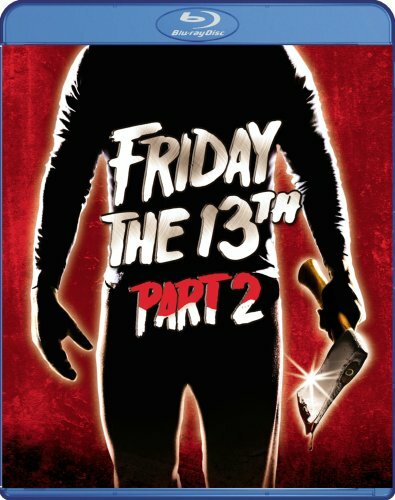 Friday the 13th part 2 opens with our resident slasher taking revenge for the events that transpired during last summer�s Camp Blood outing. There�s no mystery behind our killer�s identity and flashbacks to the first film are used to jog the audience�s memory of the ill-fated Jason Voorhees, the mongoloid child supposedly drowned in 1957. Part 2 runs with the premise, however unlikely, that Jason didn�t actually drown and instead has taken up sharp implements in order to continue the murderous work started in the original. With Jason taking center stage for the sequel, director Steve Miner keeps the pace fast and furious, delivering a much leaner slasher flick than the first. The idea, of course, is to give the audience more of what worked and part 2 does improve upon Sean Cunningham�s original with its tighter pace and confident scares. Miner builds a pervasive atmosphere through intimidating POV stalker shots while accenting the isolation of the camp setting. The authenticity of the location becomes a character unto itself through the film�s frequent nature walks and campfire sequence (complete with scary story!) to cement the feel. Part 2 builds nicely off the mythology established in the first movie in order to delve into the persona of Mr. Voorhees in a way that no other sequel would bother with. The counselors flirt briefly with his possible motivations, presenting Jason as the ultimate campfire legend in another example of how the movie drips with the camp atmosphere so many of us look for in a Friday movie. Yet to become the iconic hockey masked madman, Jason�s overalls and potato sack mask work nicely to complete the feral, man-child persona part 2�s filmmakers have created. One element often under-looked in the slasher subgenre is the cast of characters. There�s the misconception that you�re intended to root for the killer and that you should want to see our masked madman hack through the cast as quickly as possible. The creative deaths are a genre mainstay, but these movies are a lot scarier when the audience can root for the characters (otherwise, your villain is an anti-hero). Part 2 assembles a fine cast, both attractive and likable. There aren�t any character arcs to be found within the brisk running time, but the counselors are amiable without being too developed and enjoyable without bordering on the obnoxious. Steve Miner and writer Ron Kurz understand the need for this and it�s another reason why the sequel succeeds. In terms of our would-be counselors, Amy Steel is our tough and sassy survivor. People enjoy pointing out that slasher survivors must be virginal and without the indulgence of drugs (despite the fact that Jamie Lee Curtis sparks up in Halloween with Adrienne King following suit in the first Friday, while also bedding her boss), but there�s plenty of instances where you can prove otherwise. Steel�s Ginny is as promiscuous and strong-willed as anyone in the film, giving Jason one hell of a fight when the going gets tough. Her extended chase scene ranks high in the annals of not only the series, but in the subgenre in general. The rest of the cast makes an impression with the limited material. John Furey is the skeptical camp trainer who believes Jason to be little more than a campfire tale. Bill Randolph and Marta Kober are the curious young lovers who set off to explore the old Camp Blood campground while Kirsten Baker might just be the hottest camper in the franchise�s history, with those jean shorts and Mickey Mouse half-shirt, I was out of my mind the first time I saw her skinny dip into Crystal Lake and, frankly, my jaw still hits the floor today. If there�s an area where Friday the 13th part 2 yields to the original it�s the lack of gore. Carl Fullerton stepped up to the plate to bring Jason�s murderous rampage to life for the sequel after Tom Savini declined to return. The MPAA had other plans and insisted on approximately a minute�s worth of footage be excised from the final cut. The end result was a sequel offering excellent setup and failed payoff. Paramount's Blu-ray is an excellent way to watch the movie. Grain is prevalent throughout, giving this low-budget flick an exceptionally 'filmic' quality. Detail is strong (particularly in the daytime scenes) while the nighttime stuff boasts some impressively deep blacks. The film occasionally is bolstered by softness, but it could be representative of the way it was shot. Best of all there's no signs of dirt, scratches or digital sharpening. Overall, I LOVED watching Friday the 13th part 2 on Blu-ray and any big time fan will want to make the upgrade. The Dolby Digital 5.1 True HD track might not utilize all the channels like you'd hope, but it still represents a satisfying upgrade from the mono-only track the older releases had. Dialogue is crisp and audible, even when other sounds occupy the same channel. Harry Manfredini's score sounds terrific here and the textured composition is worth upgrading for. And for you purists, the mono track is still included, which I'd love to see more studios do. The blow average assortment of special features is the one thing that lowers this disc's grade. Inside Crystal Lake Memories (HD) runs 11 minutes and features a conversation between author Peter Bracke and Dark Delicacies bookstore owner Del Howison. Bracke is knowledgeable and well-spoken on the subject of F13, but this dialogue isn't going to tell fans anything they don't already know. Friday's Legacy: Horror Conventions (HD): runs just over six minutes and consists of some of Friday's players (Savini, Manfredini, Betsy Palmer) interacting with fans at conventions). Jason Forever: is a 29 minute convention panel with Jasons Ari Lehman (pt. 1), Warrington Gillette (pt. 2), C.J. Graham (pt. 6) and, of course, Kane Hodder (pts. 7-10). This is from 2004 and was previous a Best Buy exclusive from the old DVD boxset. Lost Tales From Camp Blood part II (HD): runs 9 minutes. It's another dismal short film about a slasher (not Jason) murdering people in the woods. Forgettable. I don't know why it's so hard for modern filmmakers to capture the spirit and success of these 'golden age' slasher flicks. Friday's second chapter is one of the best and it looks and sounds better than ever on Blu-ray. Even if you've got all the other DVD versions, I'm recommending the upgrade. The extras are pretty weak, but the movie more than makes up for it.